I walked to my Weight Watchers meeting this morning, breakfast in tow. I cannot possibly get weighed after I eat. And it was a good breakfast too - oats, half banana, Balkan yogurt, and cinnamon - and a good meeting, wherein we talked about breakfast ideas. I was so surprised to hear that many people eat the exact same tbreakfast every morning. I cannot imagine that. I mean, if it was a time consideration, I could perhaps understand, but these gals are pretty much all retired. That is the kind of town I live in when we are on the boat. And after I walked back to the boat, where The Captain had been having too much fun slaving away, washing the canvas that covers the cockpit, I put together a new salad combo for our lunch. I called it Sunshine Salad and it was delicious. The Captain takes a long time to eat crunchy veggies but he made it through, finally, and said he liked it. Phew. The Captain went back to his water play work, and I got organized and walked into the village. My first stop was the post office where I picked up some mail and posted some letters - yes, I do still write them, albeit short and sweet. And then I headed to the market where I purchased some dark chocolate chips and rolled oats to make up a recipe that has been rolling around in my head, for our evening sweet treat tonight. 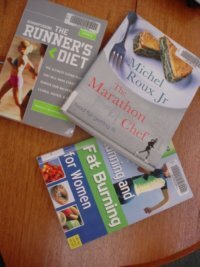 I stopped at the library on the way back to the marina and borrowed some books that I had put on reserve a few days ago. As I made my way home, I was enjoying the beautiful day and the Spring flowers, and I was thinking about all the things I want to to do over the next few days, and about how particularly happy life is lately. I am generally a pretty upbeat person, but lately I am almost giddy with happiness. Sara, from Words to Run By, was kind enough to send me a training log and one of her bumper stickers. I love this sticker and am going to put it to good use. Ditto the log book. Sara has become a real inspiration to me through her writing. I so appreciate her generosity to me, a complete stranger. Thank You, Sara, so very much. 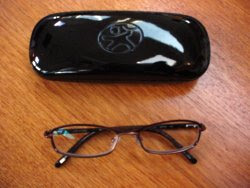 The free eyeglasses that I scored on the clearlycontacts web site promotion on Tuesday arrived already today. So I am wearing them right now and testing them out. So far so good, and they are cute. Jones New York burgundy metal frames, prescription lenses, and all I paid was the shippping. Here is the sweet treat I made tonight... melted chocolate chips, peanut butter, almond milk and oats... stir it up, spoon it onto a plate and cool in the fridge. Mmmmm. Sweet chocolatey peanut buttery mounds. Messy, cause they kinda melt on your fingers, but wonderful. 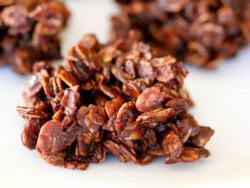 I think the next time I make them I will add dried crans or raisins. Pancake breakfast on Saturday morning, prepared by The Captain. A 6 km run with The Captain a couple of hours later. Wander around taking pictures of the Spring flowers and flowering trees I am enjoying around town right now, before they all disappear. Find those darn goslings at the neighboring bird sanctuary and get The Captain to photograph them, too. 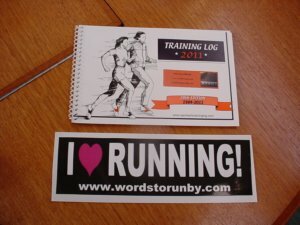 Okay, I am off to map us a 6 km run for tomorrow morning. Sara really is a true inspiration! I love reading her blog. I am reading your blog now to get caught up and so far I LOVE LOVE LOVE LOVE IT! How cool is your Galley? I am so intrigued! training log!? I have been writing my stuff down on stickie notes, definitely going to check out her site. 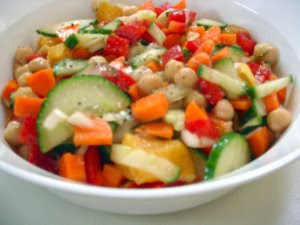 Sunshine salad looks sooo good, yum! And your salad looks so pretty and fresh!